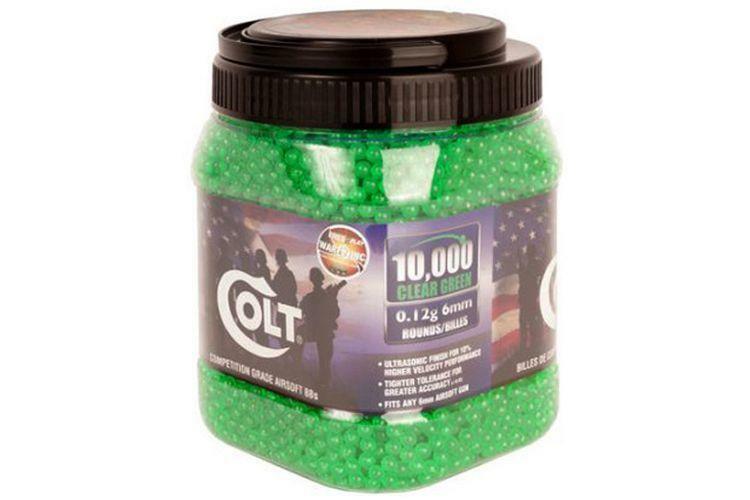 Colt Green Airsoft BBs .12g - 10000ct | Replicaairguns.ca | New Website! Comments: The Colt Green Airsoft BBs are durable and affordable. These low-cost BBs are great for target practice and casual shooting sessions. They are finished with Ultrasonic polish for faster velocities and have tight tolerances for improved accuracy. The competition-grade BBs are made of durable ABS plastic and come in a high-capacity 10,000-round jar.